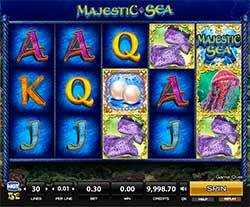 Take the plunge and explore the depths of one of the most beautiful regions of the planet in Majestic Sea slot online from IGT and H5G! Some of the most majestic creatures of the underwater world come to life with vivid images and you can swim among sharks, stingrays, sea turtles and more. Take the plunge and explore the depths of one of the most beautiful regions of the planet in Majestic Sea slot online from IGT and H5G! Some of the most majestic creatures of the underwater world come to life with vivid images and you can swim among sharks, stingrays, sea turtles and more. The game has 30 paylines across its 5-reels and lots of opportunity to find your sunken treasure. But to do it, you’ll have to face your fears and get close and personal with some of the seas most intriguing life forms. Pearl Scatter Free Spins – You will have to land a combination of 3x double pearl symbols or 2x double symbols with 1 single pearl symbol to win free spins. 3x double pearl symbols will earn you 10 free spins while 2x double pearls and 1x single will win you 5 free spins. They aren’t as hard to come by as you may think because this game also offers split symbols. Pearl Scatters Multipliers – The pearl symbol is the scatter in Majestic Sea and if you get 4 of them in a winning payline you’ll instantly win a 2x multiplier on your win. Majestic Sea Wilds – The game’s logo is the wild in this game and will substitute for all symbols except the pearl scatters to complete winning combinations when possible. The wilds will also count as double when substituting for the shark, turtle, stingray, jelly fish or yellow fish! Split Symbols – Split Symbols will show two of an image instead of just one and will count as two on a payline! For example, if in a line combination on reel 1 you have a double pearl, and then a single pearl on reels 2 and 3, this will count as a 4 pearl combination on the paytable. It gives the opportunity for more frequent rewards.